Today, Amy Whitley, the Oregon-based editor at Pit Stops for Kids cruises over to guest-post on my blog. Pit Stops for Kids is a great resource for families traveling through our region. You’ll find parent reviews on road-side attractions, restaurants, motels, parks, and airport playspaces. Seriously, her site is fantastic. Thanks, Amy. The Northwest is cross-crossed with dozens of wonderfully scenic and historic highways and byways, but sometimes, you just need to get from Point A to Point B. Living in Southern Oregon, we’ve put in our share of miles up and down I-5 from the Washington border to our north and the California border to our south. Luckily, this section of the interstate is chock full of great pit stops for kids! Enchanted Forest, Salem, Oregon. Exit 248. Enchanted Forest is what we call “theme park lite”…and when you want to stop for only a few hours, that’s a good thing! The park is pretty, imaginative, and not overwhelming in size, allowing a family to cruise through the highlights from breakfast to lunch (or stay all day if desired). My kids especially love the fairy tale village and the Indian caves (think Disney’s Tom Sawyer Island in miniature). Read a full review here! Splash! Lively Park Swim Center, Springfield, Oregon. Exit 194A. Splash! is by far the best public swimming pool we’ve ever seen! With tubes, slides, a wave pool and more, your kids will be in heaven…even if the weather is insisting on the usual Oregon drizzle. And you’ll love the affordable admission and numerous lifeguards. If you don’t have towels on-hand, they’re available! Read more!. Saturday Market, Eugene, Oregon. Exit 194B. This one is only available on Saturdays, but so much fun, it’s still worth a spot on the list! Vibrant and colorful, the Eugene Saturday Market is a great place to take kids…especially around lunchtime. You’ll find a food court full of organic, local options, live entertainment, and many clothing and artisan vendors. Lots to see and take in! On a Wildlife Safari. Photo courtesy Pit Stops for Kids. 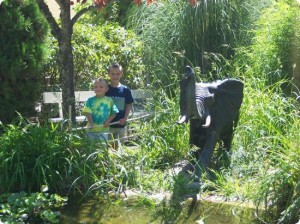 Wildlife Safari, Winston, Oregon. Exit 119. As an animal rights advocate, I was nervous the first time we visted Wildlife Safari: would it be a dubious operation? Would I feel the animals were well-cared for? I shouldn’t have worried. Wildlife Safari is an awesome experience (you get to drive past giraffes licking at your windshield and lions lounging in the sun!) and does much to educate visitors on animal welfare. You can easily spend half a day here! Details here! Lithia Park, Ashland, Oregon. Exit 19. 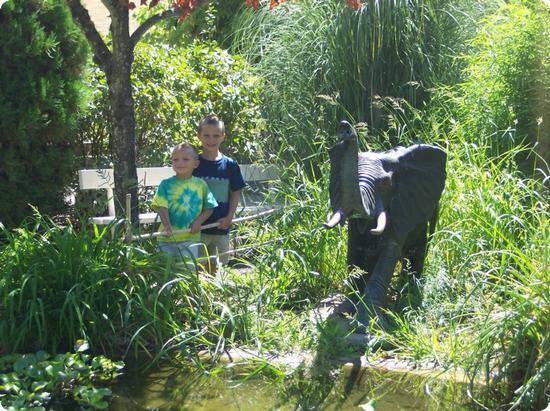 Ashland is a beautiful town with lovely restaurants and performance arts, but if you only have time to stop and let little ones stretch their legs, Lithia Park is a must. Gorgeous in all seasons, Lithia is surrounded by old-growth trees and gardens, duck ponds, walking paths, and a great play park. In the winter, try the outdoor ice rink. Photo at upper right is from Lithia Park (courtesy of Pit Stops for Kids). Directions and details here. And if the weather is bad, try out ScienceWorks Museum instead! Oregon deals, coupons and savings for family vacations in Eastern Oregon, Bend, the Oregon Coast, Newport, Mt. Hood, Portland and Southern Oregon.